Whether a veteran user of compressed air tools for the business or a new buyer looking to get their first their Quincy air compressor, the difficulty of choosing the right capacity of air compressor never seems to abate. There are numerous wise sayings when it comes to air compressors, “don’t buy too little”; “get capacity for now, not for later”, and its converse, “consider your needs in the future, not just now”, and several more. Trying to find the exact fit of Quincy air compressor is also made ‘difficult’ by their provision of choice. 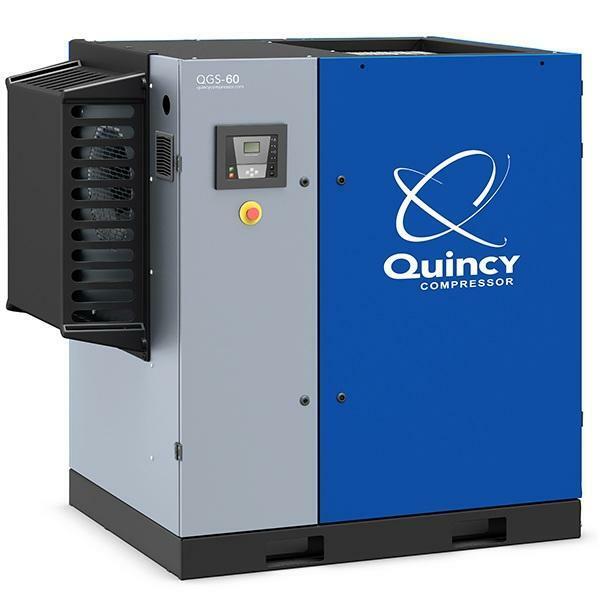 Available in a range of options, power configurations, tank sizes, orientations and setups, Quincy offers a wide selection of air compressors. So let’s try and break down this conundrum. Note, please, that this is far from buying advice; think of it more along the lines of guiding considerations that hopefully help you make the most appropriate buying decision. Exact present capacity or additional headroom? It is probably wiser to buy a Quincy air compressor which is, at the very least, slightly stronger than your exact requirement. If it is a purpose-built production line that it will exclusively be powering, then an air compressor closely matching your compressed air requirements should suffice, with some capacity to spare. Alternatively, if you will be running tools as and when needed, it is better to have a capacity that exceeds the sum cubic feet per minute (CFM) flow of all the tools. Account also for the optimal operating range of the air compressor, leaks and capacity reducing slightly with time and use. And don’t forget about your business and needs expanding with0020time. How the Quincy air compressor is to be powered depends a lot on its power, easy and cost-effective availability of whichever fuel at the premises and whether it will be used in any sort of mobile capacity. A fuel powered air compressor is best for truck-mounted or remote site operation (when electrical supply is not guaranteed). Air compressors powered by electricity will be more compact and possibly less intrusive in their operation, and generally require lesser maintenance because they have fewer moving parts. We’ll forego the discussion on tank style; that, of course, depends your setup and space constraints. But tank size of your Quincy air compressor must be suited to your unique use, and will determine compressor capacity too. Naturally, with a large tank you can provide greater CFM or for a longer period. Check to see if your tool or application running on compressed air is referred to as a continuous use appliance. If so, it is probably better to invest in a larger tank than have your air compressor running constantly during its operation – or risk having the entire system slow to a crawl.